An oversized sandwich filled with layers of meats, cheeses and other fixings that are sure to make it a hit with any crowd. 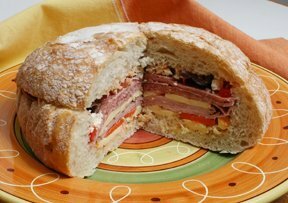 This Sicilian-style sandwich is perfect to serve at a gathering of friends and family during your Mardi Gras celebration. Learn how to make this festive cake with the special surprise baked inside for your Mardi Gras Carnival Season. To help you through the Lenten Season, this cooking guide contains instructions on a how to cook fish using a variety of methods.